Just finished putting up alle the nets when thay had to be closed again bacause of strong rain. 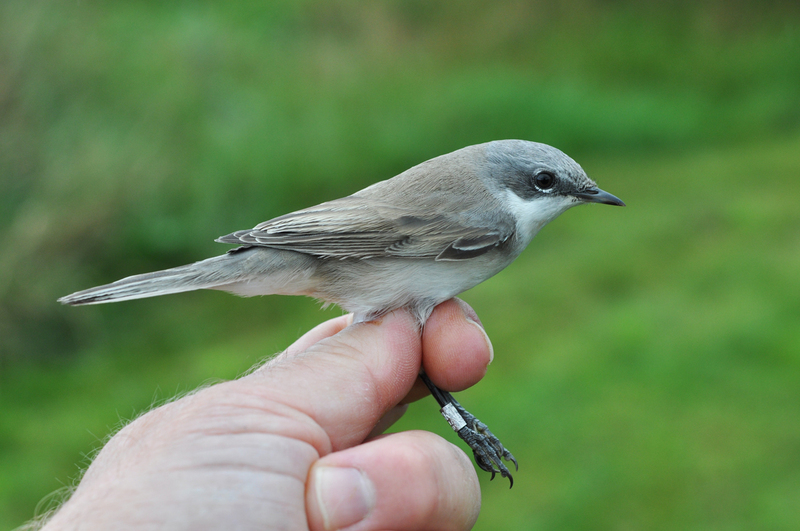 There were a few birds around though, and a few Blackcaps and two Grasshopper Warblers were caught in the short time before the nets were closed. The rain lasted less than an hour, after that the nets were open until around 16. Netmeter hours approx. 3000, playback on Garden Warbler and Grasshopper Warbler through the night and morning, Tree Pipit after that and Sand Martin for a short while in the afternoon. Pied Flycatcher, 1 cy male. Aged as 1 cy by the broad notched white fringes to tertials, and sexed as a male based on jet-black longest upper tail coverts. Svarthvit fluesnapper 1K hann. 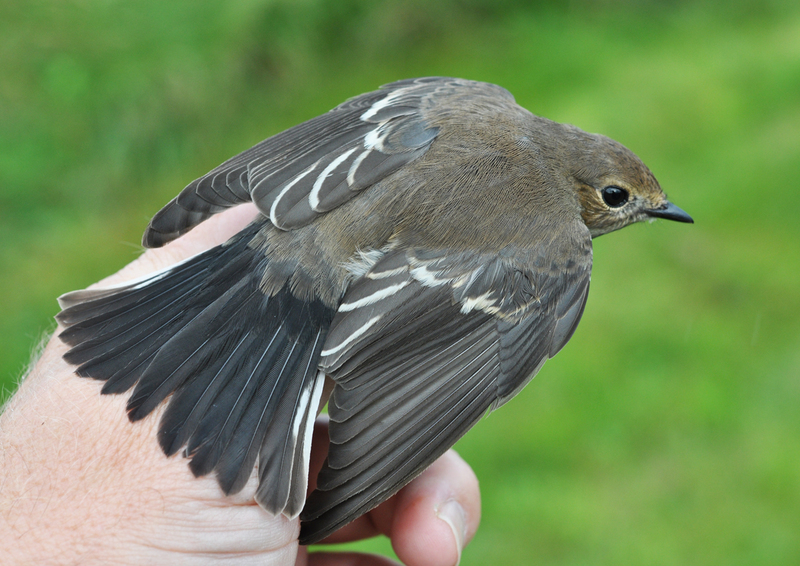 Ringed: Tree Pipit 11, White Wagtail 1, Barn Swallow 1, Sand Martin 2, Common Blackbird 1, Grasshopper Warbler 4, Reed Warbler 2, Sedge Warbler 2, Garden Warbler 8, Blackcap 10, Common Whitethroat 6, Lesser Whitethroat 1, Willow Warbler 13, Pied Flycatcher 2, RED-BACKED SHRIKE 1, House Sparrow 2, Tree Sparrow 1, Greenfinch 6, Eurasian Siskin 6, Lesser Redpoll 1. Total = 81. 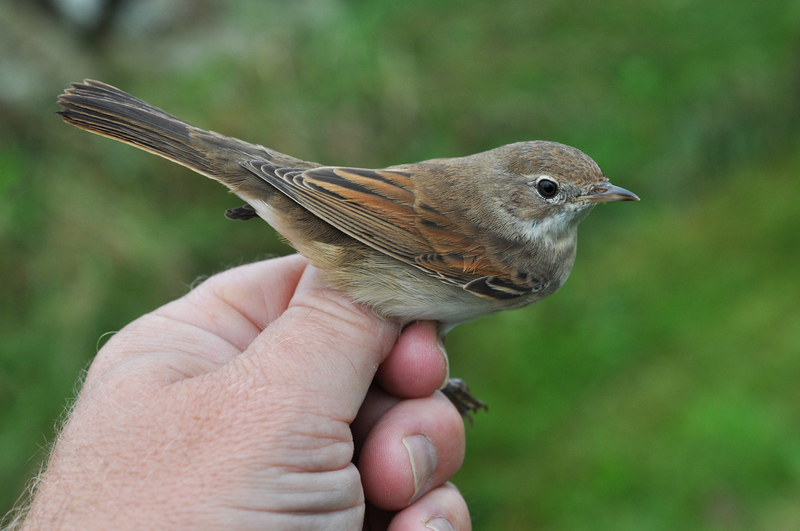 Also 20 controls, including a Willow Warbler not from Revtangen. Common (top) and Lesser Whitethroats, both are 1 cy. Pointers to age are plain grey iris in both, and details in the outer two rectrices (not visible in the pictures).